The Bell Inn looks across the Square towards the Church of St. Peter and St. Paul. It was the Walgrove (or Waldegrave) family mansion, probably built by Richard Walgrave in the early 1500s. This family had an ancient tenement of the Blockley manor and lived in the area from the 15th Century until 1712 when the last of the line died. When the Walgrave property was split up, the mansion became the Bell Inn, a hotel for travellers, for over 250 years until 1970 when it was closed. During the late 1800's the Inn used the stable and coach house (across from what is now the P.O./grocery) that had been built by Mistress Elizabeth Rushout in 1709. The "Bell Hotel" was among the properties sold by The Northwick Park Estate Sale of August 1921. It was sold privately to Flowers Brewery, Stratford. The tenant was Mr. E. Barrett, lease expiring Lady-Day 1922. The rent, paid annually, was 20 pounds 5s. When the Inn was remodeled into flats (apartments) in 1973, skeletons were found under the flooring of the Public Bar and the Smoke Room. Professor F. W. Shotton (Birmingham University) carbon-dated the bones to about 840 A.D., when the area was occupied by Saxons. In 855, there was a charter by Burgred, king of the Mercians, granting "Bloccanleeh" to Bishop Ealhun. The charter refers to a "monasterium," which was a missionary, "semi-monastic community of secular priests, deacons and clerks in minor orders sent by an early bishop of Worcester to convert and minister to the still pagan uplanders of the North Cotswolds." (Icely, pg. 8, 9) These communities would build a church, and the proximity of the skeletons to the current church building leads to the possibility that the Parish Church of St. Peter and St. Paul was built at the site of this early Saxon church and that the Coneygree Mansion was built over a portion of the old Saxon church graveyard. Icely, H. E. Blockley through Twelve Centures. Kineton: The Roundwood Press, 1974 (copyright by the Blockley Antiquarian Society), pgs. 8, 9, 45, 48, 82, and 94. Malin, John. The Northwick Park Estates Sale (Of Mills and Cottages) of 1920. 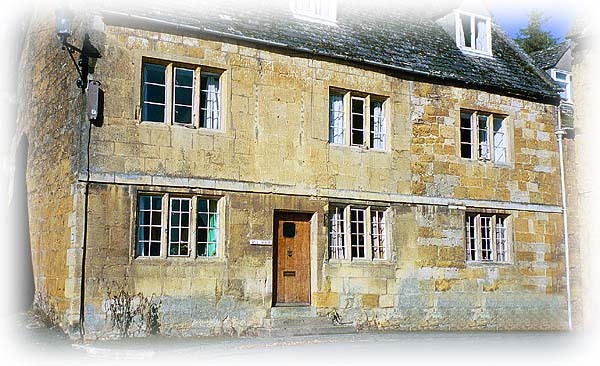 Published privately: Blockley, England, 1998, pg. 4.